Olympic marathon in the DMZ in 2032? 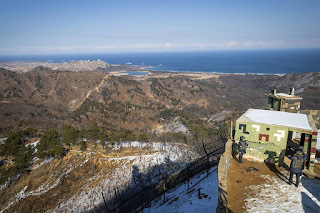 Readers of this blog will know that I've posted frequently about the role of ICT in the Olympics (check these posts) and on the future of the demilitarized zone (see also these posts). The latest development in these areas is the news that the two Koreas may jointly bid to host the summer Olympics in 2032. 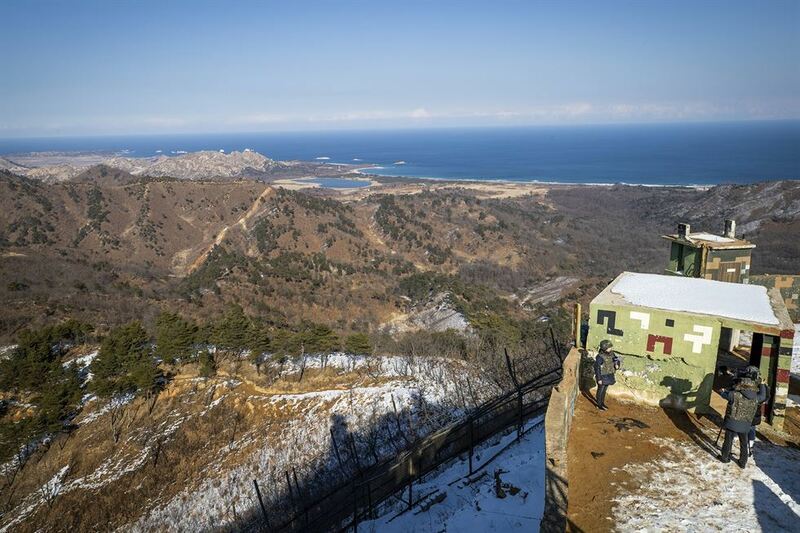 As reported by The Korea Times, a working draft of Seoul's bid to co-host the 2032 Olympics with Pyongyang suggests that "...Olympic runners and cyclists may be able to compete inside the heavily fortified demilitarized zone (DMZ). The Seoul Metropolitan Government says the DMZ ― a symbol of painful division and the ongoing military standoff between the two Koreas ― is under review as a possible venue for long-distance outdoor events like marathon, cycling and triathlon competitions if it gets to host the games with Pyongyang." An article in the Korea Joongang Daily underscores the extent and nature of Korea's dependence on the manufacture and export of digital technologies. The headline is "Export decline picks up speed in January." 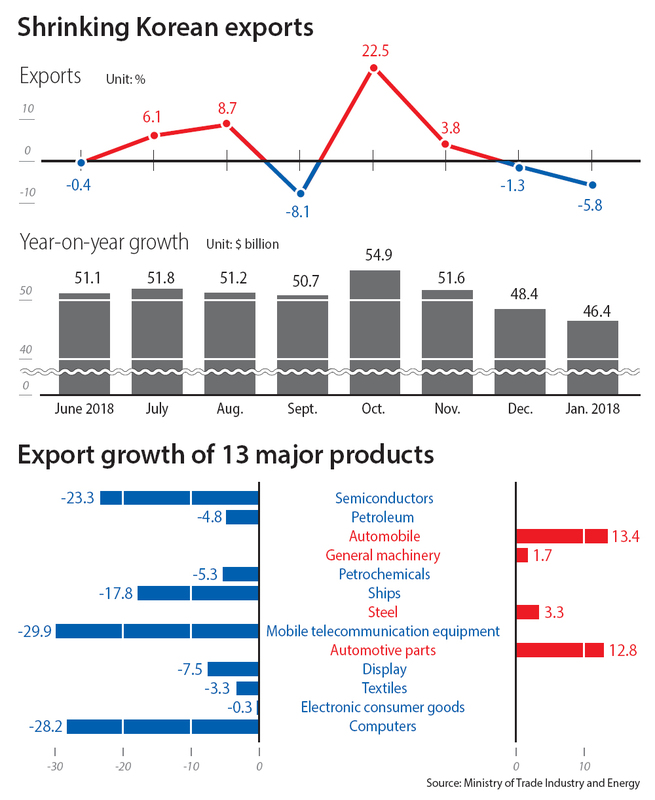 As shown by the accompanying graphic (click for a full size version), the leading exports responsible for this overall decline are all digital (ICT sector) manufactured products. (NOTE: there is a typo in the black and white bar chart included in the graphic-- the bar for "January 2018" actually represents data for January 2019. 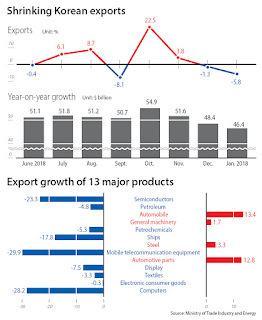 Also, in the bottom part of the graphic, red bars under the heading "Export growth of 13 major products" represent positive growth while the blue bars show declining growth.) However, the article strongly supports the main point of this post, that Korea's export-led economy, while ICT-driven, is heavily (perhaps too heavily) dependent on manufactured products rather than software and services. 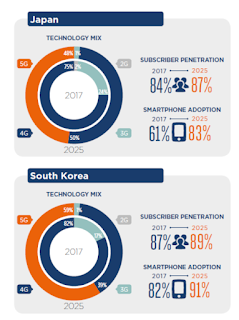 The GSMA Mobile Economy 2018 report, along with its regional report, The Mobile Economy Asia-Pacific 2018 contain some interesting projections. Both reports analyze the time frame from 2017 to 2025. Globally, the reports project likely trends. One of these is that the Asia-Pacific Region will lead the transition to 4G and then 5G. The graphic (click for a full size version) reveals the report's finding of greatest interest to me. 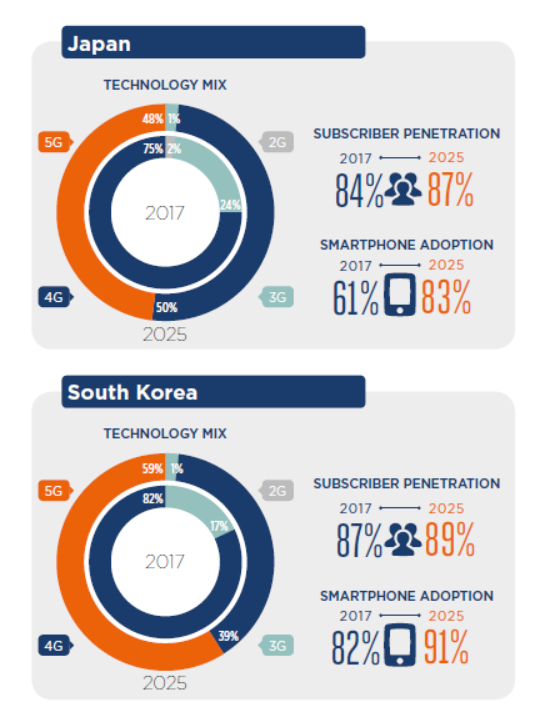 It is from the Asia Pacific report and shows that South Korea is currently the world leader in 4G and smartphone adoption, and is projected to lead the way on adoption of 5G as well by 2025. I've chosen to include data for Japan in this graphic because it is the country most closely positioned to compete with Korea. For further detail, read the GSMA reports, linked above.